Join apexart and other neighborhood art spaces as we stay open after hours, with a special sound performance by Sto Len entitled Imaginary Waterscapes no.1 (for the islands of New York) at 7:00pm. 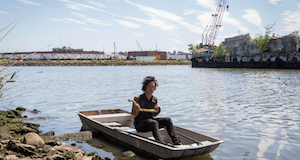 In conjunction with Tracing Obsolescence, artist Sto Len welcomes the public to a site along the Newtown Creek to see a new installation, followed by a special sound performance on the river. Obsolescence sometimes seems an unavoidable part of modern life. Consumer goods become outdated and are replaced, while factories and mines close as their activities are outsourced, offshored, or become redundant. Despite efforts to 'reduce, reuse, recycle,' throwaway culture is entrenched. In America's current political moment, industrial decline is a familiar concept, and the social and environmental problems it causes are typically discussed in the context of the Rust Belt and deprived former mining towns. Such places have rightly become the object of intense public scrutiny, in an effort to diagnose their social ills and political leanings. But what does obsolescence mean in a world that is characterized by renewal, transformation, and interconnection' Obsolete objects do not cease to exist once they are replaced by a shiny new model; their stories continue, albeit in sometimes unobtrusive or unknown ways. The impacts of declining industrial-scale manufacturing and extraction do not end in their immediate communities, but are widespread and intertwined. These transformations contain surprising historical layers and feedback loops, reaching into corners near and far and creating unexpected points of contact between apparently disparate places and people. From an abandoned factory on another continent to the discarded cell phone at the back of your bottom drawer, these sites of encounter may appear remote or mundane, yet they contain meaning and beauty that reward greater attention. Tracing Obsolescence brings together four artists who follow the material and psychic traces left by deindustrialization and material decline. Working within different geographical contexts and scales, through printmaking, sculpture, installation, and performance, they attend to goods that have been discarded, places that are abandoned, and memories that seem forgotten. By inserting themselves into these histories, the artists examine the processes and trajectories of deterioration and abandonment, noting that they may be experienced differently depending on one's position in relation to the chain of production. For these artists, the act of tracing obsolescence becomes a political gesture: it is a refusal to see material degradation as a one-way trajectory towards redundancy, and an insistence on the ongoing repercussions of decay, beyond the point at which most of us have stopped paying attention. They question the finality of obsolescence, reactivating materials in order to investigate contemporary environmental, socio-economic, and geopolitical crises. 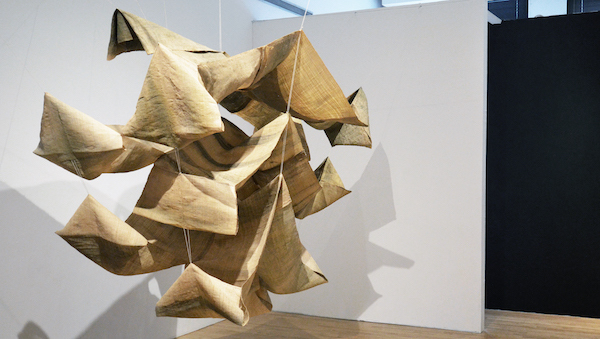 Sto Len's printmaking and performance practice exists through collaboration with nature. Using an adaptation of suminagashi, a 12th-century Japanese technique of printing from ink floating on water, Len captures the moving surface of the Newtown Creek, a polluted 3.8-mile tributary of the East River flowing between Brooklyn and Queens in New York City. Drawn to the solitude and serenity he finds there, Len maintains a studio-shack at the creek's eastern terminus in Maspeth, an area originally called 'Mespeatches' after the Native American people of the same name who lived there. Mespeatches translates as 'at the bad water place. '1 While the name once referred to the area's abundant swamps, in today's Newtown Creek the 'bad water' comes from a variety of sources. Beyond oil leaks from the refineries that operated in the area from the mid-nineteenth century'including the notorious Greenpoint oil spill, uncovered in 1978'the creek has long been used as a place to dump all kinds of refuse including animal and human waste, grease, and acid. The closure of many industrial plants in the area did little to stem the toxic flow. Unbeknownst to most New Yorkers it is now one of the most polluted waterways in the US, and in 2010, was designated a high-priority Superfund site by the Environmental Protection Agency. Len's work exposes New York's dirtiest secret. He explores the creek by boat, observing the patterns created on its oily surface and occasionally intervening with a stick or brush. Toxic historical sludge rises from the riverbed, creating a palimpsest of industrial decay, past and present. Capturing the composition is a delicate process, involving laying the paper down on the water's surface, carefully retrieving it without tearing or smudging, and transporting it back to the bank to dry out. Recently, Len's 'Pollution Print' series has expanded to projects in Colombia and also Vietnam, where he has developed installation-performances drawing on Vietnamese funeral traditions. His altars honor the 'deceased' water, inviting people to grieve and reflect on their relationship with this vital resource and the natural world more generally. For Len, juxtaposing the beautiful with the disgusting is a way of approaching political environmentalism without pushing an overt message or agenda. By revealing its material traces, his prints draw attention to the lingering effects of industrial waste, both on the environment and on its human dependents. 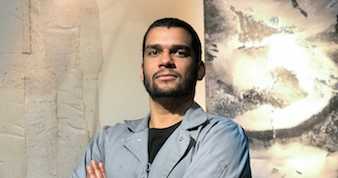 Through his work in sculpture and installation, Tahir Karmali critiques abusive neocolonial mining practices in Africa, as well as disposable consumerism. For the STRATA series, Karmali ritually deconstructs discarded cell phone batteries to remove their copper and aluminum components. Through a range of interventions'water baths, hand tools, a kitchen blender'the raw materials of cobalt, graphite, and lithium are extracted for use as dyes. Karmali's canvas is raffia sourced from the Democratic Republic of the Congo, the country which also supplies over half the world's mined cobalt through often exploitative and dangerous labor practices. Drawing on traditional Congolese techniques used in the making of Kuba cloth, Karmali dyes and then manipulates the raffia to create sculptures with complex topographies. With their sedimentary-like layers, undulations and crevices, the works allude to the thickness of layered histories'both geological and human'as well as the literal and metaphorical excavations through which these histories are unearthed and reshaped in the present. By recuperating and recombining Congolese and other materials into original sculptural forms, Karmali creates for them new pathways and new meanings. Collapsing the distinction between the acquisitive consumption of Africa's resources and their aesthetic consumption in the gallery space, STRATA makes conspicuous the unequal nature of human relationships to raw materials. Karmali also obliquely references the problematic circular fate of many cell phones: having had their material origins in cobalt mines in the DRC, and having passed through the hands of consumers in wealthy countries like the US, they eventually find their way back to Africa either as trash, or as hand-me-downs. The unfairness of this is not incidental to Karmali's practice; his ongoing investigations into cell phone production seek to uncover the human cost of the constant demand for new electronic devices. In Selasi Awusi Sosu's work, an abandoned glass factory in Aboso, in the Western Region of Ghana, inspires an empathetic reanimation of lost industry. During site visits and interviews with former factory staff, Sosu discovered a community that has been irrevocably changed. Their secure livelihoods lost, many of the factory workers had turned to illegal artisanal gold mining, a practice known locally as 'Galamsey.' Digging by hand, Galamseyers operate under conditions of economic disadvantage and physical danger. Their work also has detrimental effects on the surrounding environment, polluting rivers and contaminating the drinking water supply. Sosu's installation, The Glass Factory, adapts the nineteenth-century optical illusion technique known as Pepper's Ghost to bring the factory back to life. Four moving images of the same object'in this case, a glass bottle, like those once produced by the factory'are projected onto the walls of a plexiglass prism, forming a 3D holographic vessel. The accompanying atmospheric sounds are reminders of the factory's fate; in place of the workers' commanding voices are the chirrups and squawks of the site's new feathered inhabitants. The decline of factories in countries marginalised in the global economic system is also central to the work of Dana Whabira. In her piece Nobody's Thing I, a discarded dress form acquired from the auction remnants of a bankrupt business in Harare, Zimbabwe, becomes a symbol of the slump in the country's textile industry, a process at least partially caused by international agreements drawn up in distant boardrooms. In particular, the end of arrangements restricting textile exports from China in 2005, combined with Zimbabwe's downturn in the midst of the global economic crisis, crippled the local economy.3 Whabira reflects on the historical notion of 'tributary states''states held in a system of unbalanced power relations, often through the regular transfer of wealth'as an analogy for the ways in which entire economic sectors can be adversely affected in certain places thanks to the vagaries of the world market. Beyond a critique of crippling trade agreements, the double meaning of the word 'tributary' points to deeper layers in Whabira's work. Rivers and their tributaries are one of the defining features of colonial maps of Africa, along with the presence of gold and other resources that determined borders during the partition of the continent. The title Nobody's Thing I refers to res nullius, a legal term used to justify colonialism through the notion that land and resources were owned by nobody (despite being occupied) and therefore open to appropriation. Incorporating stains and dirt adhering to the dress form from its journey toward redundancy, Whabira embroiders its surface with black cotton thread to create a new, subversive kind of cartography. The use of black thread, ordinarily used for hair-braiding, references pre-colonial transatlantic narratives of slaves who plaited detailed maps of escape routes into their hair, while the process of stitching into the form'puncturing the torso, creating scar-like lines'points to sites of colonial trauma and processes of repair and healing. Nobody's Thing I thus embodies the ways that global economic systems and colonial histories intersect to act upon human bodies. In bringing these diverse works together, Tracing Obsolescence attempts to reveal their points of contact, both conceptually and materially. From waterways to factory floors, through mapping and mark-making, these artists' works propose non-linear, context-embedded ways of tracing obsolescence through an expanded view of post-industrial landscapes, revealing material circuits and trajectories that may be redirected to create unexpected, problematic, and mysterious beauty. 1. Sto Len borrows the name for his artist's book, Bad Water Place (2017), which documents his printmaking practice on the Newtown Creek. 2. These interventions include the Structural Adjustment Program and Economic Recovery Program of the 1980s and 1990s, and the Heavily Indebted Poor Countries (HIPC) Initiative of the 2000s. 3. The Multifiber Arrangement (1974-2004) and the subsequent Agreement on Textiles and Clothing imposed quotas on the amount of textiles and clothing developing countries were allowed to export to developed countries. When the quotas ceased, China's textile exports grew at the expense of other countries, particularly those in Sub-Saharan Africa. Irene Brambilla, Amit Khandelwal, Peter Schlott, 'China's Experience Under the Multifiber Arrangement (MFA) and the Agreement on Textiles and Clothing (ATC),' National Bureau of Economic Research, August 2007, Accessed July 30, 2018, http://www.nber.org/papers/w13346.pdf. Evelyn Owen is a writer and curator based in New York City. A cultural geographer by training, her research explores contested geographical imaginations, especially in relation to contemporary art from Africa and its Diaspora. 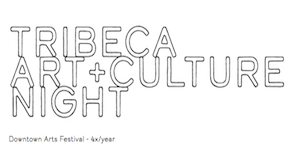 She is currently the Curatorial Fellow at The Africa Center, NYC. Her writing has been published by The Guardian, FOAM, Contemporary&, Okayafrica, 1-54, and Africa is a Country. She received her PhD with a thesis on the geographies of contemporary African art from Queen Mary, University of London.